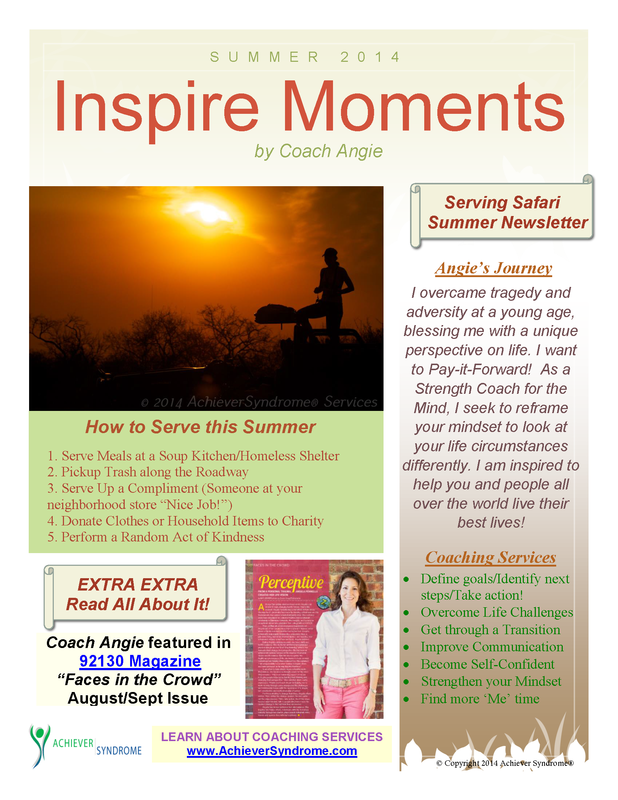 Achiever, Believer, Survivor, Angie is a woman who reaches for the stars and dreams BIG…no matter what curve ball, or truck in her case, may hit her! Angie’s Don’t Stop Believing attitude helped her to survive an almost deadly car accident in 2002 when a reckless driver hit her head-on. She suffered severe head trauma, had over 1000 stitches to her face and body, in addition to a lacerated liver, punctured lung, and many other internal injuries & contusions. Drawing upon her physical and mental inner strength as a standout student-athlete (Division 1 college volleyball Captain), and she found the courage to fight through a year-long rehabilitation and survive the horrific accident. Against all odds, she got back on her feet and built a very successful career in medical & pharmaceutical sales. After learning how fragile life can be, and being given a second chance in life, she felt a responsibility to inspire others and make an impact on the way they live their lives! calling on her to do. She decided it was time for a change. A big change! 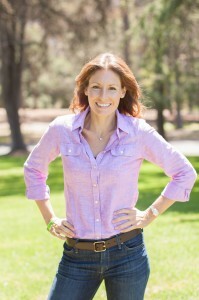 In December of 2010, she took a leap of faith to follow her dream and moved 3000 miles west to Southern California. After establishing herself in her new community, she decided to use the wisdom she gained from her accident to help people across the country overcome challenges in their lives. Some of the issues she helps people with include achieving work-life balance, goal-setting, motivation, assertiveness, transitions, communication, and guidance and courage to take the next step in life. 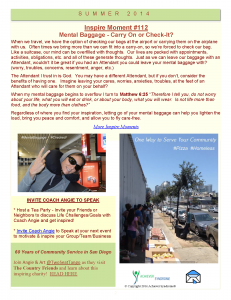 Today, Coach Angie is a Strength Coach for the Mind, Certified Life Coach, creator of the ACHIEVER SYNDROME ®, and an Inspirational Speaker and Writer. 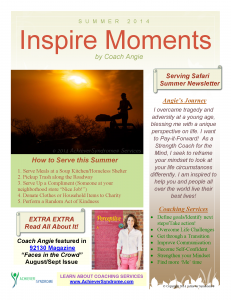 She shares her unique perspective through her blog, Inspire Moments. She identified the ACHIEVER SYNDROME ® which is the an unhealthy focus of accomplishing professional and personal goals, that results in inner discontent and an unbalanced life. She then developed the System for Balance to help people with this syndrome to overcome it. 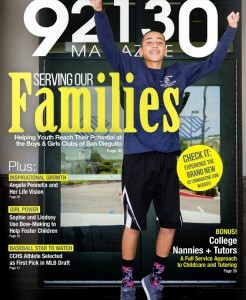 92130 Magazine features Coach Angie and how she turned her own tragedy and adversity into her life’s mission, to inspire others and help them live their best lives! 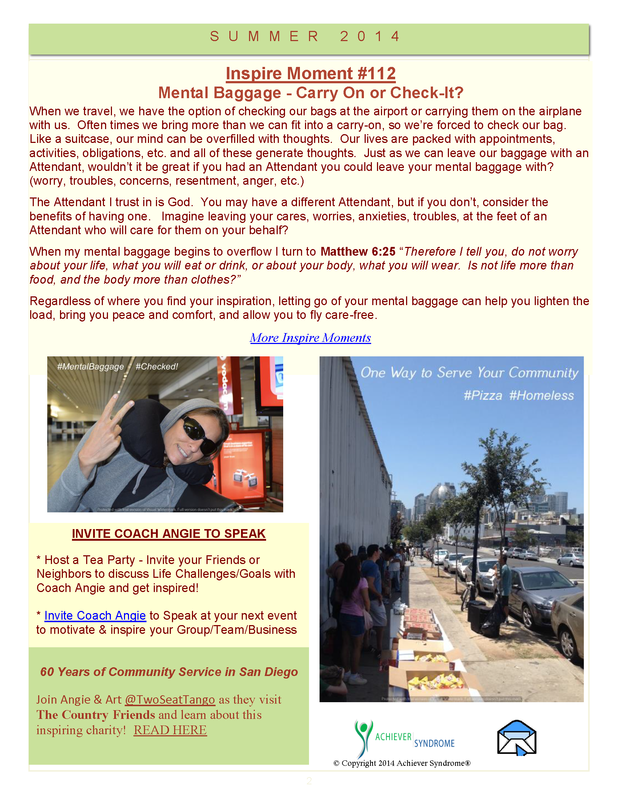 To have Coach Angie speak at your next event, to set up an individual/group coaching session(s), or for more information, please fill out the Contact Form on this page and she will be in touch with you! Meeting Planners, please click here to learn more information about booking Angie for a speaking event.